Dubai - UAE, November 12, 2017: Aimed at emphasizing the role of heavy vehicles in ensuring safety on UAE roads, Dubai Police, in partnership with MAN Truck & Bus Middle East and RoadSafetyUAE, today hosted an event for fleet owners and other stakeholders of the public and private sectors, showcasing various road safety initiatives and solutions to reduce heavy commercial traffic incidents in the country. The event explored ways to boost road safety, in line with the targets outlined in ‘UAE Vision 2021’, which aim to reduce road traffic fatalities from about 6/100,000 residents (end 2016) to 3/100,000 by 2021. 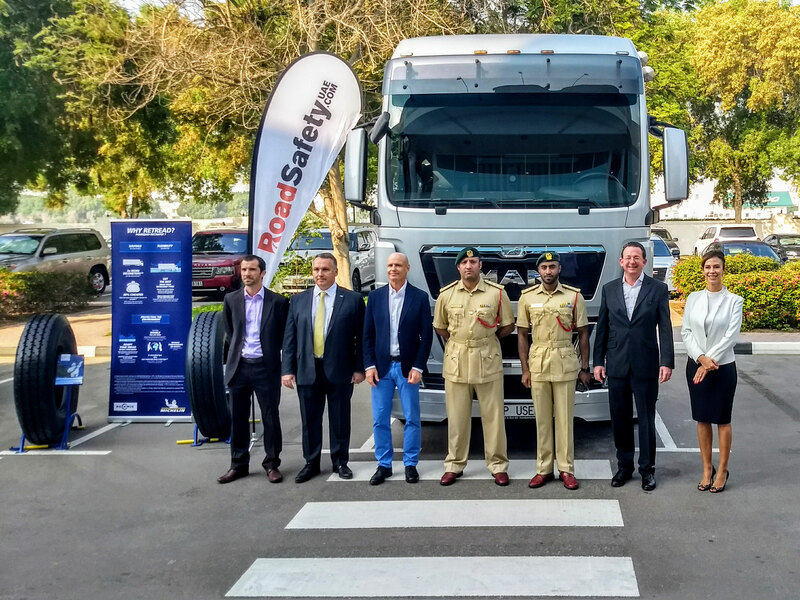 The event highlighted the ongoing efforts by MAN to increase road safety, both by building safety into its trucks and fostering a culture of safe driving. Participants gained insights into how proper safety measures, best tyre and load practices, technology-driven solutions and driver training support programs can lead to a significant drop in road incidents. Thomas Edelmann, Managing Director of RoadSafetyUAE states: “MAN is setting a great example as a pro-active thought-leader in the commercial vehicle industry by committing resources to arrange such an impact-strong event, which educates the involved stakeholders and also provides a great networking platform to connect delegates and to foster new ideas of how to tackle road safety”. Taking the event to a new level, the senior representatives from MAN presented an interactive ‘Truck Safety Walk-Around’, which examined various factors leading to fatal accidents, Mr. Redwitz added. MAN representatives encouraged fleet owners to establish a framework in their companies for continuous education for drivers. They introduced the MAN ProfiDrive® program which improves driver knowledge and skills and promotes rational driving behavior to make every day driving safer and more economic. They also demonstrated a number of technological solutions developed by MAN such as Electronic Stability Program (ESP), Anti-Spin Regulator (ASR), Constant Damping Control (CDC), and MAN TeleMatics®, an intelligent technology solution that provides drivers and fleet managers with essential data to optimize vehicle usage and plan services well in advance, and comprising a MAN Tachograph which automatically records the vehicle’s speed, distance travelled, and time spent on the road, helping keep tired drivers off the roads.